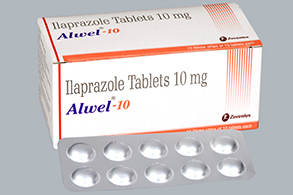 Ilaprazole is a proton pump inhibitor (PPI) used in the treatment of dyspepsia, peptic ulcer disease, gastroesophageal reflux disease and duodenal ulcer. Ilaprazole (trade name Noltec) is a proton pump inhibitor (PPI) used in the treatment of dyspepsia, peptic ulcer disease (PUD),gastroesophageal reflux disease (GORD/GERD) and duodenal ulcer. It is available in strengths of 5, 10, and 20 mg.
Ilaprazole is a substituted benzimidazole proton pump inhibitor first launched in 2008 by Livzon in China for the oral treatment of peptic ulcers. The compound was also being evaluated in early clinical trials at Il-Yang for the treatment of gastroesophageal reflux disease (GERD), but no recent development has been reported. In 2009, development of the compound was discontinued by Takeda Pharmaceuticals North America for the treatment of esophagitis due to a phase II study which did not meet its predefined endpoint. The drug has been shown to significantly inhibit acute gastric erosion induced by indomethacin, ethanol or stress, acute mepirizole induced duodenal ulcers, and to accelerate the healing of acetic acid induced chronic ulcers through a H+/K+-ATPase inhibition mechanism. In September 2005, TAP (a joint venture established between Abbott and Takeda which was dissolved in 2008) and Il-Yang signed a license agreement, granting the latter development and distribution rights to the drug candidate worldwide outside of Korea and China. Il-Yang Pharm. Co., Ltd., Korea has developed a Novel PPI, i.e. 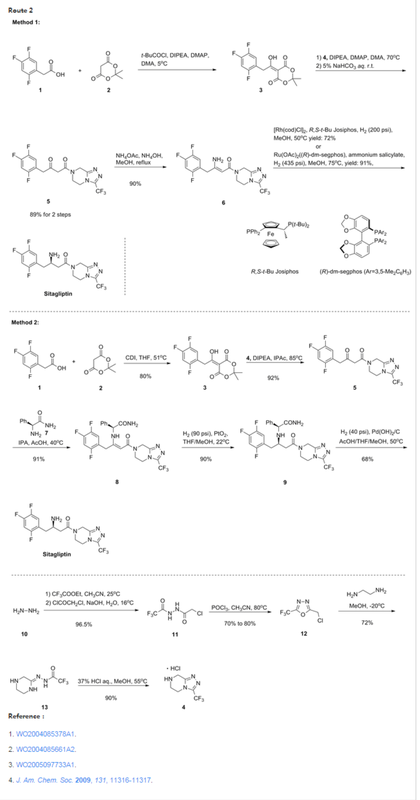 racemic 5-(1H-pyrrol-1-yl)- 2[[(3-methyl-4-methoxy-2-Pyridyl)-methyl]sulfinyl]-benzimidaziole[1,2], which shows superior anti-ulcer effects as compared to Omeprazole in the treatment of GORD(gastro-oesophageal reflux diseases), gastric ulcer and duodenal ulcer (KR 179,401 and US 5,703,097). Gastric and duodenal ulcers are a gastrointestinal disease caused by various factors such as mental stress, dietary habit, intake of irritable food, and the like. The direct cause of peptic ulcers is damage to the gastric membrane due to excessive secretion of gastric acid. Since their introduction in the late 1980s, proton pump inhibitors have improved the treatment of various acid-related gastrointestinal (GI) disorders, including gastroesophageal reflux disease (GERD), peptic ulcer disease, Zollinger-Ellison Syndrome (ZES), ulcers, and nonsteroidal anti-inflammatory drug (NSAID)-induced gastropathy. GERD encompasses three disease categories: non-erosive reflux disease (NERD), erosive esophagitis, and Barrett’s esophagus. ZES is caused by a gastrin-secreting tumor of the pancreas that stimulates the acid-secreting cells of the stomach to maximal activity. Proton pump inhibitors have also be used to treat ulcers such as duodenal, gastric, and NSAID-associated gastric/duodenal ulcers. As antisecretory drugs, proton pump inhibitors are currently the recommended first line therapy, being viewed as more effective than other treatments. In general, proton pump inhibitors offer superior gastric acid suppression over histamine H2-receptor blockers. The use of proton pump inhibitors by patients who suffer from gastric acid-related disorders is generally believed to have led to an increase in their quality of life, productivity, and overall well being. Proton pump inhibitors are also used to treat extra-esophageal manifestations of GERD (asthma, hoarseness, chronic cough, non-cardiac chest pain), and with antibiotics for Helicobacter pylori eradication. The goals of GERD management are threefold: prompt and sustained symptom control, healing of the injured esophageal mucosa and prevention of GERD-related complications (including stricture Formation, Barrett’s esophagus, and/or adenocarcinoma). Pharmacological therapy with proton pump inhibitors Forms the basis of both acute and long-term management of GERD. Proton pump inhibitors provide effective relief of symptoms and healing of the esophagitis, as well as sustaining long-term remission. Although therapeutic efficacy is the primary concern for a therapeutic agent, the solid-state form, as well as the salt form, and the properties unique to the particular form of a drug candidate are often equally important to its development. Each solid state form (crystalline or amorphous) of a drug candidate can have different physical and chemical properties, for example, solubility, stability, or the ability to be reproduced. These properties can impact the ultimate pharmaceutical dosage form, the optimization of manufacturing processes, and absorption in the body. Moreover, finding the most adequate form for further drug development can reduce the term and the cost of that development. Ilaprazole, 2[[(4-methoxy-3-methyl-2-pyridinyl)-methyl]sulfinyl]-5-(1H-pyrrol-1-yl) 1H-Benzimidazole, is a substituted benzimidazole that acts as a proton pump inhibitor. Ilaprazole selectively and irreversibly inhibits gastric acid secretion through inhibition of the hydrogen-potassium adenosine triphosphatase (H+K+-ATPase) (proton pump) mechanism. Inhibition of the proton pump occurs by formation of disulfide covalent bonds with accessible cysteines on the enzyme. Ilaprazole has a prolonged duration of action that persists after their elimination from plasma. See, for example, U.S. Pat. Nos. 5,703,097 and 6,280,773, which are incorporated herein by reference. The absolute structure and absolute confirmation of (−)-S-ilaprazole was made through single crystal structure determination and is shown below. See Example 7 of co-pending U.S. application Ser. No. 11/966,808 of Brackett et al. entitled, “Solid State Forms of Enantiopure Ilaprazole” filed Dec. 28, 2007, herein incorporated by reference in its entirety. 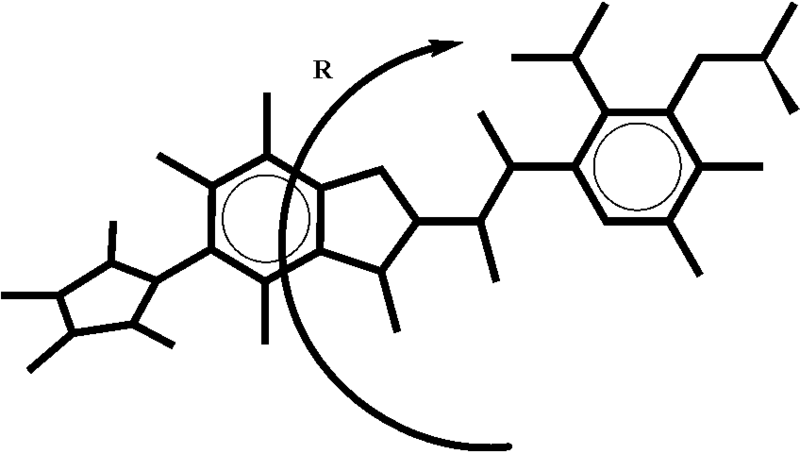 Thus, its complimentary enantiomer is (+)-R-ilaprazole, as shown below. 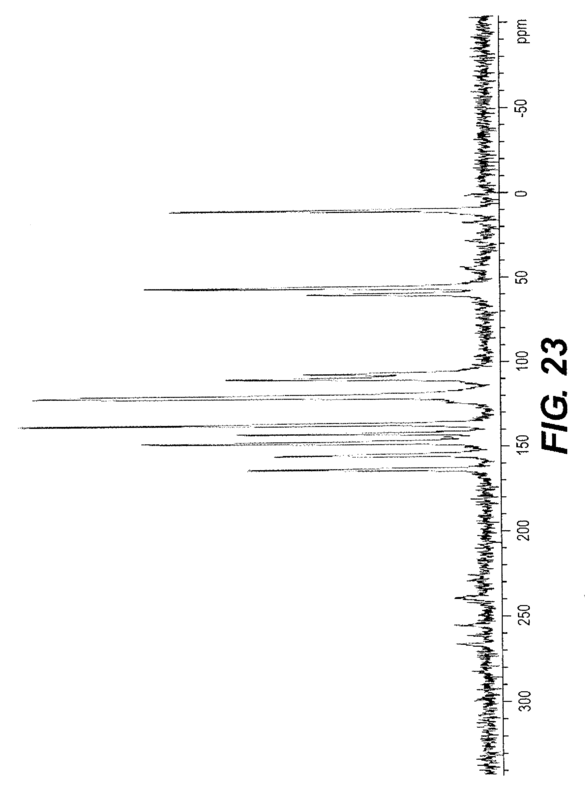 The condensation of 2-(chloromethyl)-4-methoxy-3-methylpyridine (I) with 5-(1-pyrrolidinyl)benzimidazole-2-thiol (II) by means of NaOH in hot methanol gives 2-(4-methoxy-3-methyl-2-pyridylmethylsulfanyl)-5-(1-pyrrolidinyl)benzimidazole (III), which is finally oxidized with m-chloroperbenzoic acid (MCPBA) in chloroform. 3-Methoxy-2-methylpyridine (VII), prepared by methylation of 2-methyl-3-pyridinol (VI), was converted to the N-oxide (VIII) employing peracetic acid. Nitration of the pyridine N-oxide (VIII) with concentrated nitric acid gave the 4-nitro derivative (IX). Subsequent displacement of the nitro group of (IX) by sodium methoxide led to the dimethoxypyridine N-oxide (X). Rearrangement of the N-oxide group of (X) in hot acetic anhydride produced the acetoxymethyl pyridine (XI). After basic hydrolysis of the acetate ester (XI), the resultant hydroxymethyl pyridine (XII) was chlorinated by SOCl2, yielding chloride (XIII). Condensation between mercapto benzimidazole (V) and the chloromethyl pyridine (XIII) in ethanolic NaOH led to the sulfide adduct (XIV). This was finally oxidized to the desired sulfoxide by using meta-chloroperbenzoic acid in CH2Cl2. The oxidation of sulfide (XIV) has also been performed employing sodium perborate, sodium percarbonate in the presence of ammonium molybdate, or tert-butyl hydroperoxide in the presence of vanadyl acetylacetonate. 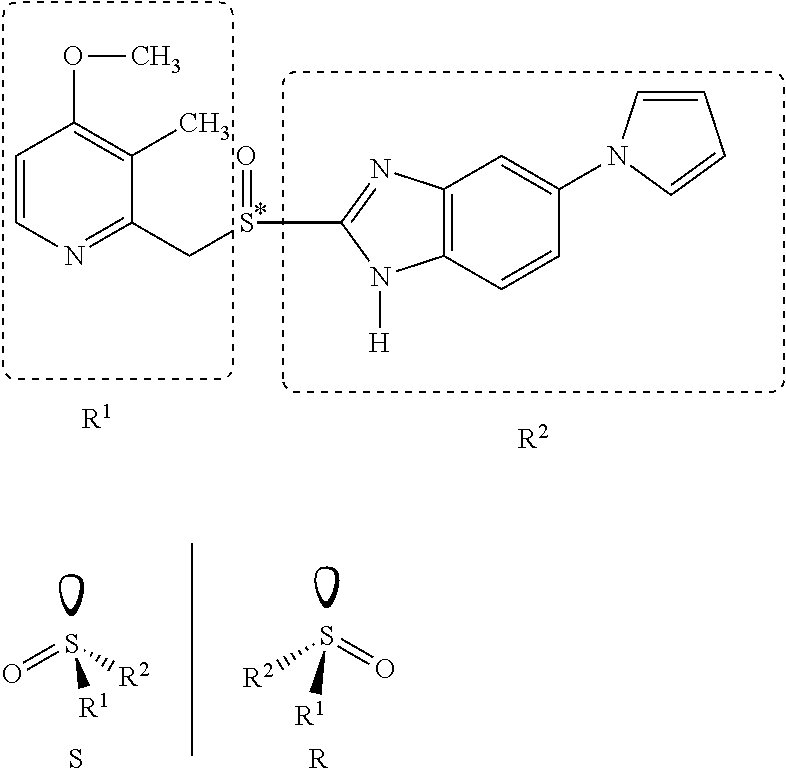 The synthesis of IY-81149 can be obtained according to Scheme 22875502a. The oxidation of 2,3-lutidine (I) with hydrogen peroxide in acetic acid affords 2,3-dimethylpyridine-N-oxide (II), which is treated with sulfuric acid and nitric acid to give the corresponding nitro compound (III). The treatment of (III) with NaOH in methanol gives 2,3-dimethyl-4-methoxypyridine-N-oxide (IV), which is reacted with acetic acid and acetic anhydride and oxidized in refluxing NaOH, yielding 3-methyl-4-methoxypyridine-2-methanol (V). The chlorination of (V) with thionylchloride in CH2Cl2 affords 3-methyl-4-methoxy-2-chloromethylpyridine (VI). The reaction of 2-mercapto-5-nitrobenzimidazole (VII) with iron and concentrated HCl in refluxing ethanol and water gives monoamine (VIII), which by condensation with 2,5-dimethoxytetrahydrofuran (IX) in acetic acid yields 2-mercapto-5-(1-pyrrolyl)benzimidazole (X). The condensation of (VI) with (X) by means of NaOH in methanol gives 2-[(4-methoxy-3-methyl-2-pyridinyl)methylsulfanyl]-5-(1H-pyrrol-1-yl)-1H-benzimidazole (XI), which is finally treated with m-chloroperoxybenzoic acid (m-CPBA) in chloroform. 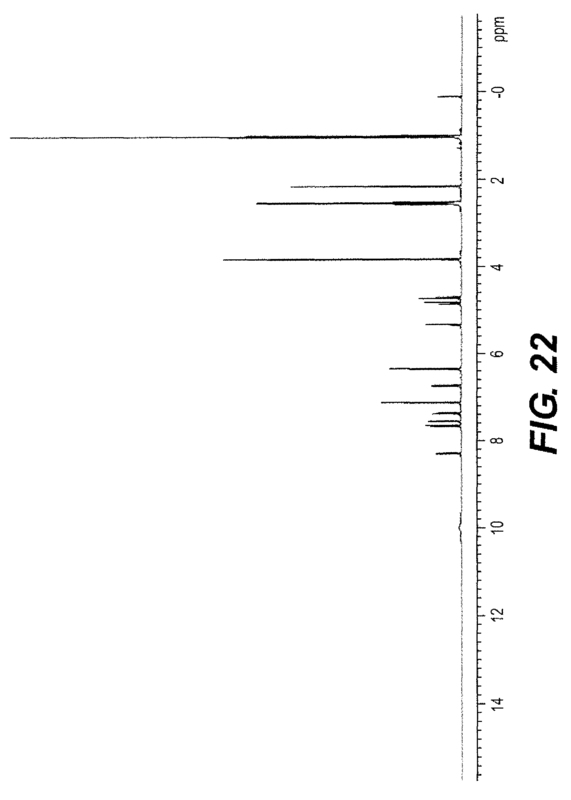 There are very few patent documents related to crystallization of ilaprazole. The example 2 of Indian Patent No. 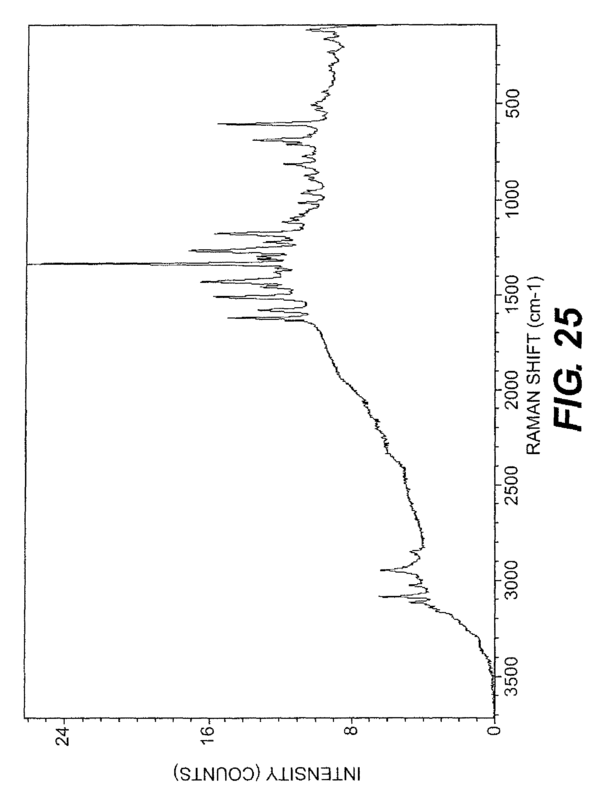 183088 describes crystallization of ilaprazole from mixture of ethyl acetate and ether. Indian patent application No. 3607/DELNP/2009 discloses various crystalline forms: A, B, E, F, I of ilaprazole and process for their preparation. The crystalline form B of ilaprazole is obtained by crystallization from acetone/triethylamine in a refrigerator for 11 days. The form B is characterized by peaks at 12.6 and 18.1 degree 2Θ in X-ray powder differactogram. Another Indian patent application No. 3634/DELNP/2009 discloses various solvates of ilaprazole, these are crystalline form C (1,4-dioxane hemisolvate), D (tetrahydrofuran hemisolvate), G (methanol solvate), K (hydrate) of ilaprzole and process for their preparation. International Patent Publication No. WO 2011/071314 discloses process for the preparation of Form A and Form B. The process for the preparation of Form A involves conversion of ilaprazole to its inorganic salt followed by neutralization with suitable acid in a solvent. The process for preparation of Form B requires use of multiple solvents for the crystallization. The physical or chemical properties of a drug can vary depending on the crystalline form of the drug, and such physical and chemical properties can greatly influence a suitable dosage form of the drug, the optimization of a process for preparing the drug, and the in vivo absorption of the drug. The discovery of the most appropriate crystalline form of a drug in a procedure for developing the drug enables the development time and cost to be reduced. FIG. 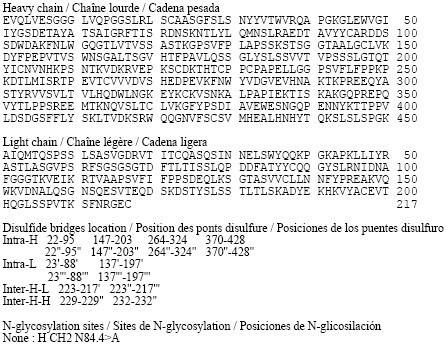 22 is the proton NMR spectrum of racemic ilaprazole, Form F.
FIG. 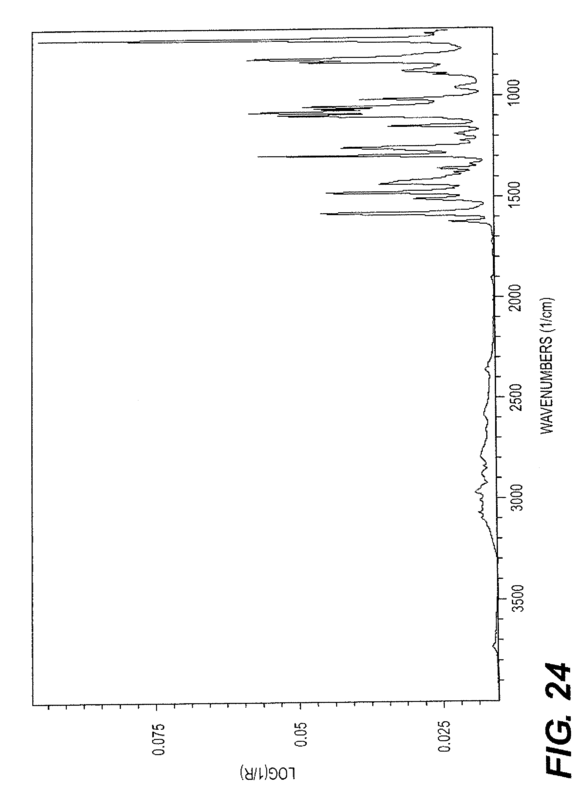 23 is the solid state 13C CP/MAS ssNMR spectrum of racemic ilaprazole, Form F.
FIG. 24 is the IR spectrum of racemic ilaprazole, Form F.
FIG. 25 is the RAMAN spectrum of racemic ilaprazole, Form F.
“Ilaprazole for the Treatment of Duodenal Ulcer in Chinese Patients (Phase 3)”. By DR ANTHONY MELVIN CRASTO Ph.D in Phase3 drugs on February 11, 2016 .